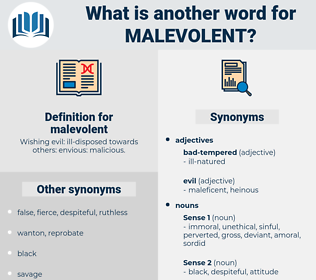 What is another word for malevolent? 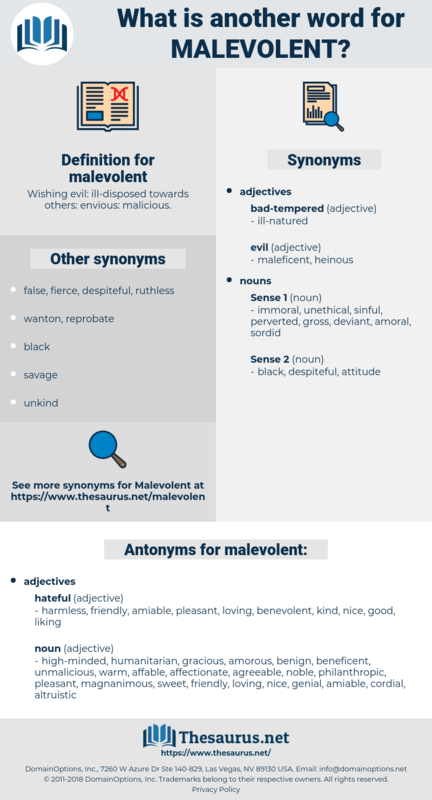 Wishing evil: ill- disposed towards others: envious: malicious. harmless, friendly, amiable, pleasant, loving, benevolent, kind, nice, good, liking. genial, warm, affable, agreeable, sweet, altruistic, cordial, magnanimous, amorous, noble, unmalicious, philanthropic, high-minded, affectionate, humanitarian, beneficent, gracious, benign. All employers of labor had been malevolent. His eyes alight with an exultant, malevolent fire, he gripped Hollis's throat with one hand and drove at his face with the other.